As more and more biopharmaceuticals move along the torturous process of development, clinical evaluation, and approval, dealing with changes to these complex protein molecules becomes increasingly paramount. A number of meetings and symposia have examined this question lately, and it’s clear that the technology is ramping up to successfully add or delete whole classes of changes when necessary. Gary Walsh, Ph.D., associate professor at the University of Limerick in Ireland, foresees a wave of advances in fundamental post-translational modification (PTM) engineering technologies as new protein therapeutics work their way through the research lab and into the marketplace. With more than 2,000 biopharmaceuticals in clinical and preclinical development, there will be a pressing need for platforms that can successfully address the upscaling of highly modified protein therapeutics. Dr. Walsh believes that biosimilars will become increasingly important and the issue of achieving their appropriate post-translational modification profile will constitute a major challenge in coming years. The EMA has already approved six biosimilars, and many more are being evaluated. Whereas glycosylation is the major concern of post-translational engineers, there are many other alterations in protein molecules that may be required for appropriate performance. These include acetylation, ADP-ribosylation, acylation, phosphorylation, disulfide bond formation, proteolytic processing, γ-carboxylation, β-hydroxylation, amidation, and sulphation. A major component of research in this area is concerned with the redesign of production systems to move post-translational modifications forward on an industrial scale, according to Dr. Walsh. As an example, cell lines are being engineered for improved glycosylation production by inactivating glycosylation enzymes that are problematic. One of these is the Potelligent cell line, in which fucosyltransferase is knocked out from the CHO parent cell. This allows the stable production of fucose-free antibodies, which show dramatically enhanced ADCC in vitro and ex vivo, and improved in vivo activity. Another engineering accomplishment eliminates the problem of hypermannosylation in yeast. GlycoFi has radically engineered Pichia pastoris, knocking out four genes while at the same time introducing 14 others. Yet another protein-production platform that has received relatively little notice is plant systems, which may generate hyperglycosylated products containing α-1,3-fucose and β-1,2-xylose. Greenovation Biotech working with moss, and Biolex which is based on the exploitation of duckweed, have engineered around this problem. “Choosing an expression system capable of generating an appropriate post-translational product profile remains one of the most crucial decisions drug developers must make,” says Dr. Walsh. According to Greenovation, moss offers unique opportunities for bioengineering. Moss-based production is accomplished in disposable bag reactors at the company. The moss Physcomitrella patens offers unique opportunities for bioengineering, according to Andreas Schaaf, Ph.D., head of R&D at Greenovation. All green plants use photons of light to produce energy, so they thrive in simple media while retaining the ability to produce complex, post-translationally modified proteins at the same time. Mosses are different from more advanced plants in that they are haploid through most of their life cycle and can be easily engineered to avoid plant-specific xylose and fucose glycosylation steps, for instance. Finally, as a fully contained, whole plant production system, bryotechnology enjoys several regulatory advantages, according to Dr. Schaaf. The culture medium is free of any animal-derived compounds, and there is no chance of inadvertent passage of viruses or prions in the products. Glycosylation is the most important secondary modification occurring in proteins, and over time it has become increasingly clear that it has a major impact on the performance of biopharmaceutical products. Because a substantial level of variability is inherent in any bioprocess, it is critical to recognize the parameters that can be controlled and to ensure that the conditions will be maintained so that a given glycoform is obtained consistently. Much of Dr. Butler’s work has focused on the cell lines used for protein production. Dr. Butler’s lab has been instrumental in adapting the new technologies of targeted gene integration to mammalian cells. This is a notable improvement over random transgene integration, which is noted for progressive gene loss and highly variable expression. “Now we employ vectors in which the genes are flanked by insulators, boundary elements, or ubiquitous chromatin segments, which promotes stable expression.” Other strategies include maintaining nutritional control in fed batch cultures and the use of anti-apoptotic genes to prolong cell survival. According to Dr. Butler, there are numerous small molecular enhancers, such as sodium butyrate, that can increase cell production in a consistent fashion. “But perhaps the simplest approach that we have studied is mild hypothermia, typically grown at 30–32°C.” This gambit can produce enhanced productivity with minimal effects on glycosylation products. The pros and cons of newly developed cells will have to be evaluated on a project-by-project basis. The human PerC6 and HEK296 cell lines are strong candidates for general use in biopharmaceutics manufacture, given that they do not generate the potentially highly immunogenic glycans such as Neu5Gc or Gal1,3Gal residues. Such residues can cause an adverse immunogenic reaction or reduce the half life of injected proteins due to their rapid clearance by the immune system. So it appears that a small and select group of mammalian cell lines will continue to be favored for the production of glycosylated protein therapeutics for some time to come. “We are in the process of upscaling production of the Fc gamma receptor protein (FcgR) for use in clinical trials,” says Peter Sondermann, Ph.D., CSO at SuppreMol (www.suppremol.com). The company’s goal is to address a range of autoimmune disorders through the use of Fc receptor-based therapies. In IgG-mediated autoimmune diseases, humoral and cellular effector functions, interacting through the Fc part of the immune complexed IgGs, can react against host tissues. To interrupt the cycle of this destructive process, the company has developed SM101, a soluble human FcγRIIb receptor that interferes with the interaction of immune complexed IgG with FcγR-expressing cells and complement. SuppreMol’s strategy for the treatment of autoimmune diseases is based on the fact that soluble Fcγ receptors in the circulation may compete with the cellular Fcγ receptors for the immune complexes. By introducing augmented levels of the receptor proteins into the patients’ circulation, Dr. Sondermann argues that they prevent the binding of the immune complexes to the cell and inhibit the feedback loop of autoantibody production, formation of additional immune complexes, and restimulation of immune cells. For clinical trials, it was necessary to produce large quantities of the protein through an improved production train. “We initially developed a GMP 20–30 g/batch method, which we scaled up to 300 g/batch. This was required because the previous process was not scalable. We are now able to expand our protocols to any volume that we want, up to the 100,000 L range.” Further modification of the fermentation fed batch process increased cell density by a factor of five and also improved downstream processing per volume to a five- to sevenfold more efficient level than before. During their efforts to upscale production of the receptor protein, the SuppreMol scientists did not have to contend with glycosylation, so they were able to employ an E. coli expression system, with the protein produced in inclusion bodies. But even though the Fc receptors are not glycosylated, it was necessary to resolve the post-translation problem of correct disulfide bridge formation and subsequent folding and formation of the polypeptide chain to yield an active product. At the downstream end, Dr. Sondermann and his colleagues employ classical chromatographic separation, since inclusion bodies that are prepared just by a simple centrifugation of the cell lysate already contain almost exclusively the target protein. Therefore, the purification does not require an affinity matrix or an affinity tag fused to the product. Especially for very complex drugs such as EPO (erythropoeitin) and Factor VIII, inconsistency in glycosylation can be the cause of failed batches with out-of-specification patterns. Frequently, biopharma companies and regulatory authorities disagree on the consequences to patients of alterations in drug glycosylation following scale-up and other manufacturing changes, leading to delays in approval. Even when regulators and therapeutics companies agree, detailed characterization studies may be required, which significantly increase the time to market. SuppreMol is in the process of upscaling production of its Fc gamma receptor protein for use in clinical trials. 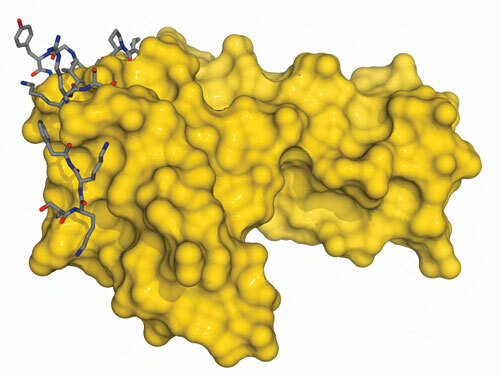 Crystal structure of soluble human FcgRllb (SM101, gold) with the IgG-contacting amino acids in ball-and-stick representation is shown. Deamidation is one of a number of chemical degradative changes, that can cause concern in biopharmaceutical production circles. Deamidation most commonly occurs at asparagine residues, and it can pose a risk to manufacturing consistency (such as heterogeneity), potency, and in vivo stability. The deamidation reaction results in a change in the local charge and/or conformation, which in critical regions (such as CDR) of antibodies can directly affect the biopharmaceutical activity. The potential for deamidation at such sites, therefore, needs to be investigated and monitored. Deamidation in other regions (including the Fc) may also affect properties such as stability, pharmacokinetics, and effector function. Dr. Kippen stresses the importance of analytical strategies for the assessment of deamidation. Techniques that are applied in his laboratory include peptide mapping, ion-exchange chromatography, and isoelectric focusing (IEF or cIEF). Certain conditions such as high pH and temperature can accelerate the deamidation reaction (that can be used to measure product risk to potential deamidation) and should be controlled during production to ensure consistency. Peptide mapping is frequently combined with mass spectrometry (LC-MS) for identification, allowing deamidation at specific sites to be detected. Routine methods such as IEF are of value in monitoring antibody stability over time in order to develop appropriate guidelines for storage (and shelf-life) of biopharmaceuticals. “Whereas antibodies are no more at risk than other protein molecules to the degradative potential of deamidation, routine tools to monitor product consistency and stability are critical,” Dr. Kippen explains. The bad news is that post-translational modifications can severely compromise the performance of biopharmaceuticals, there are numerous sizes and shapes in which these molecular modifications appear, and monitoring them will impinge upon the introduction of biosimilars. The good news is that the techniques for their assessment are becoming more accurate, economical, and readily available. This is encouraging news for the biotechnology industry as more and more products reach the marketplace. K. John Morrow Jr., Ph.D. (jmorrow@genengnews.com), is president of Newport Biotech and a contributing editor for GEN.